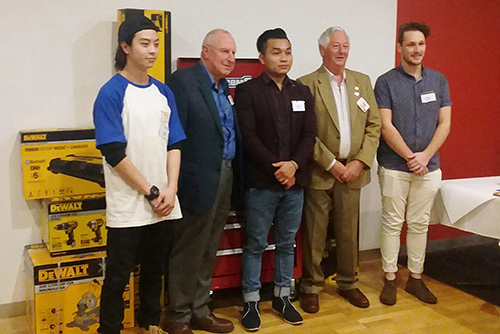 Box Hill Institute student, James Park has been presented with the Ford Davis Encouragement Award at the 2018 Rotary Club of Forest Hill Apprentice Awards Night and received a selection of tools of his trade. James said that being able to create and build things inspires him to work hard to chase his goals. James’ employer recommended that he study at Box Hill Institute based on the great things he had heard about the place. During high school, James studied design technology, which involved woodwork and he said this inspired him to pursue a career where he could make things for himself and others. James said the best thing about studying at Box Hill Institute is the helpful teachers and staff. He commended the teachers for sharing their knowledge and industry experience, and he has enjoyed meeting new people and having smokos.